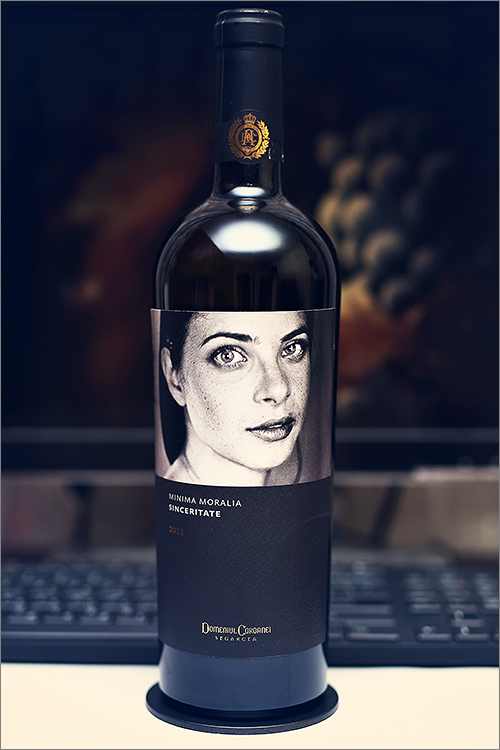 Tonight we are going to review a wine, that is quite special, as it is a white blend made of viognier and tamaioasa romaneasca grape varieties – Minima Moralia Sinceritate 2011 from Domeniul Coroanei Segarcea. This wine is part of the Minima Moralia series, that is made of wines, where humanity meets nature, and when humanity and wine interweave, it brings out the richest of both worlds. What makes this wine special is the viognier variety, as the wine itself is a blend between oaked viognier, unoaked viognier and tamaioasa romaneasca and its name is as pure as the wine itself – ‘Honesty‘, because one word of truth outweighs the world. And on that thought, let’s move on to the tasting and find out just how good this wine is. Deep and pale yellow color with shades of green hay towards the rim of the glass. The nose is rich, filled mostly with sweet fruits and herbal flavours: yellow apple, straw grass, green apricot, wormwood, arugula, currant leaf, camomile, lemon, butter, moist wood and some nuanced hints of chalkstone. The wine is dry, with moderate alcohol level, high acidity and smooth tannin. It tastes smooth, buttery and crisp with a refreshing zesty accent. This is a lean, woody and opulent wine, with a quite crisp and elegant body and a fair overall balance. It has a medium-plus finish and a balanced, a bit oily aftertaste. This is definitely a great Wine of Romania and the overall rating says the same, with 90.0 points scored it is right there, among the best wines we’ve tasted so far. Please click on the chart icon on the left in order to get to the wine rating page, where you can find all the wines we’ve tasted to date. Conclusion: this is a wine in its peak form – oily, smooth and well balanced, still, it does not display signs of ageing potential, therefore drink it now, as we do not believe it is worth any more bottle-ageing. Also, to be mentioned here is that fact that this wine was awarded 88 points by Robert Parker, which is twice as nice. We would recommend to accompany this wine with a fruit & cheese board, or pair it with fat-rich fish dishes, like for example a pan-fried trout seasoned with garlic and lemon juice. Enjoy!